This WOD caught my eye on the P3 site the other day. Looks easy enough now doesn’t it? We know how that always turns out. Way to go Brad, Gary and Christina! 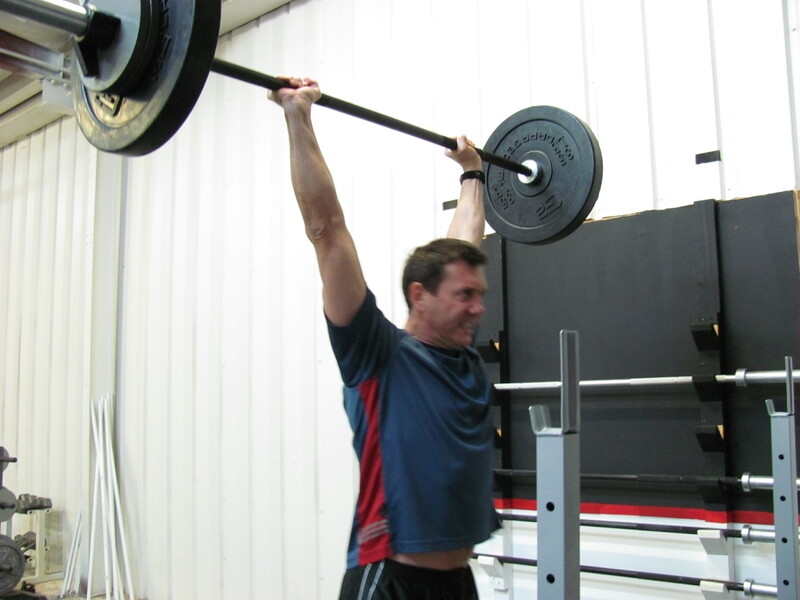 Great effort on the push press, Gary! Brad you made it look easy. Christina, fantastic push press. I almost caught up with you. Still waiting on the photo finish results of our “inchworm” race, Gary. Will post my results after everyone has had a chance to do the WOD. Making a new mix of music that Matt will not “diss”. No,… I think you owe ME one. Whatever that may be. I wouldn’t have stayed up till midnight watching BBall if I had known what was in store. Good work out. May have to attempt double unders next time. PR in Push Press of 155lb, not counting the “hanging push press” of 165lb (don’t think 3/4 press counts). Was also very excited to get a new PR in the inch-worm race. Linda, photo finish comfirmed a tie. We’ll have to race again soon. I am so sorry I missed you guys this morning………I honestly don’t know what happened to my alarm. I woke up around 6AM feeling so rested 🙂 I would much rather have done it with you guys than to have to read about it and dread it all day. Maybe I need a back up alarm………. Christina, I’m with Gary, you owe him one!!!! Did the WOD in 9:49 w/95# Thrusters. Really should have done 105 or 115# Thrusters but that’s OK; the DUs had me GASPING for air. OK Thursday gang, Wed set the bar high. PR’s were knocked out right and left today in the Strength component and the improvement in everyone’s jump rope in 30 days phenomenal. Tim all 180 double unders (I stayed an extra 20 min to practice after watching him go). Remember your journals are your road map. The more complete the picture of where you have been, the more we understand where you are at and can most quickly get where you want to go. We come here to excel not endure. Can’t remember my time at all………..but overall a great workout. I appreciate you making us go heavy Matt, I do want to be stronger and you are definitely pushing me. Jim, even though you won’t read this, you did a great job this morning. It is so exciting to see someone try something new and give it their all. Zach, great job on the double unders…………I need a clinic!